Here, five must-know potato preparations beyond the basic mashed, baked, fried and roasted. In this week’s episode of Mad Genius Tips, F&W’s Justin Chapple reveals an easy way to prep perfect hasselback potatoes. A traditional Swedish recipe, the accordion-cut potatoes take their name from Hasselbacken, the restaurant in Stockholm that first served the dish. It’s a must-add to your potato repertoire. Here, five more must-know potato preparations beyond the basic mashed, baked, fried and roasted. 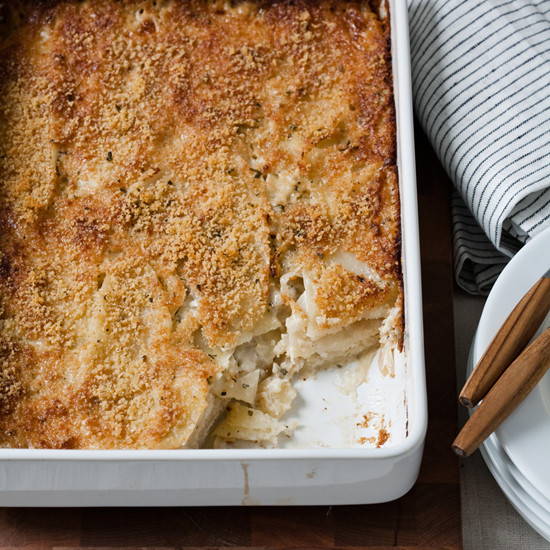 It’s hard to imagine something more satisfying than this indulgent dish of thinly sliced potatoes layered with cheese and simmered in cream. Chef April Bloomfield calls this dish of crisp potatoes and caramelized onions the “ultimate home fry.” Her perfected version also includes chopped garlic, lemon juice and crushed red pepper. This dairy-rich take on mashed potatoes is folded with whipped cream for a silky texture. If fondue and mashed potatoes had a delicious baby, it would be aligot. It’s traditionally made with Tomme de Laguiole or Tomme d’Auvergne cheeses but it’s also delicious with Comté or Fontina. These ultra-fluffy potato puffs are made with mashed potatoes and pâte à choux—the same dough used for profiteroles, cream puffs and éclairs.